When Katarina Bishop was three, her parents took her on a trip to the Louvre...to case it. For her seventh birthday, Katarina and her Uncle Eddie traveled to Austria...to steal the crown jewels. When Kat turned fifteen, she planned a con of her own - scamming her way into the best boarding school in the country, determined to leave the family business behind. Unfortunately, leaving "the life" for a normal life proves harder than she'd expected. How about that for a mindblowingly exciting synopsis? However, yet again it is a sad fact that a significant number of boys may not take the plunge due to the main character being female. This is the third book that I have reviewed this month where the main character is a teenage girl and this book is up there with my other favourite books of the year so far. Heist Society was released in the US at the beginning of February and isn't officially published in the UK yet, although you can get your hands on a copy through amazon.co.uk as I did - I just couldn't resist as the synopsis hooked me from the moment I first read it. I love heist movies like Ocean's 11/12/13, and one of my favourite TV shows is BBC's Hustle, so this book was always going to have huge appeal for me, but above everything else the synopsis reminded me of my all-time favourite series of books, a series featuring a female main character called Modesty Blaise. Modesty Blaise was created by author Peter O'Donnell and artist Jim Holdaway, and started as a comic strip in London's Evening Standard, way back in 1963. Its popularity led to the making of a film, and Peter O'Donnell was invited to write a novel to tie in with the movie. The book was brilliant, the film completely dreadful. Over the next few decades Mr O'Donnell went on to write a total of eleven Modesty Blaise novels and two collections of short stories. Modesty Blaise is often described as a female James Bond, although this comparison is not totally accurate - she is more like Leslie Charteris' Saint, in that she is not a secret agent, she is a retired criminal who occasionally helps out the British secret service when her special talents are called for. As I have already said - I love these books. Modesty is an intelligent, strong, highly skilled woman who values loyalty above everything else. Her confidant and partner-in-crime, Willie Garvin, is equally as skilled and also provides some of the humour that runs throughout the series. Their adventures, often referred to as capers by the pair, as always incredibly perilous, and the methods by which they survive the many deadly attempts on their lives always very well imagined by the author. The villains are nastier than anything Ian Fleming had to offer and the action scenes are always leave you breathless. These books are not really suitable for younger boys - the violence is not much greater than anything you would find in many YA books today, but there are numerous sexual references (nothing graphic, and certainly no problem for the 14+ age group). 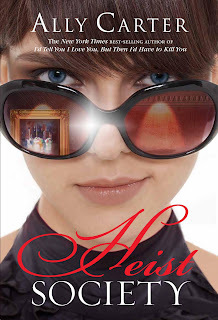 I could wax lyrical about these books for hours, but this review is supposed to be about Ally Carter's Heist Society. Like I said, I ordered it because it reminded me of the Modesty Blaise stories, and I am very happy to say that I wasn't at all disappointed. All the elements I love so much are present in bucketfulls - the tight plotting and fast pacing, the banter, the ingenious capers, the peril, the great characters - this could become a very successful series, and I believe there has already been some form of movie-deal arranged. The main character is Kat Bishop. Her parents are criminals. Her uncle is a criminal. In fact, it would seem all of her close friends and family are thieves. Kat has tried to turn her back on this life, but through the machinations of a friend she is soon drawn back into the world of cons and high-class theft. Kat is a very strong character - if it wasn't for the fact that she is a thief then she would make a great role model for readers of the book, both male and female. She is an intelligent young lady who is fiercely loyal to her friends and family, determined to ensure their safety even if it puts her own life and freedom at risk. She is surrounded by strong character but always manages to hold her own, even when they all may disagree with her actions. Some of these character are a little cliched, but who cares when a story is this good? The plotting in a story like this has to be very tight, and Ms Carter manages this with great skill. If you have ever seen the Ocean's films or Hustle then you will know that sometimes not all is clear, and you are always kept guessing as to how the 'job' will work out successfully. Both feed you tiny morsels of information along the way as little hints, often so subtly revealed that blink and you miss them. Ally Carter does exactly this with Heist Society - you really will struggle to guess what is going to happen next, but when the conclusion is reached you look back and kick yourself for not having spotted some of the clues. One of the things that turns boys away from books with female main characters is their concern that they may be filled with romance. Yes, there is some hint of romance in this story, but it definitely takes a backseat to the main heist plot. In fact, most of the really great boy-friendly books out there with male main characters have some form of romantic element (Steve Feasey's Changeling series and MG Harris' Joshua Files are two perfect examples), and Heist Society contains no more romance than these. Above everything else this is an intelligent action story and you would be a fool not to give it a chance just because there may be the odd romantic aspect to the story. In this seventh and last book of The Keys to the Kingdom, the mysteries of the House, the Architect, the Trustees, the Keys and the Will are revealed, and the fate of Arthur, our Earth, and the entire Universe is finally decided. Arthur has wrested the Sixth Key from Superior Saturday, but has fallen from the Incomparable Gardens; fallen not to the Upper House but to somewhere completely unexpected. Alone in enemy territory, as his mind and body are further transformed by the power of the Keys, Arthur must struggle with himself as much as with his many enemies. In my mind, Anthony Horowitz perfectly summed up this whole series with the following prophetic statement that was used by the publishers at the beginning of this series: "I just loved Mister Monday, which is an amazing, no-holds-barred fantasy by Garth Nix. This is destined to be a cult series. Every chapter seems to bring something new and wonderful and ends with another surprise. In all honesty, I've never read anything quite like it and I simply can't wait for Tuesday." As far as this series is concerned I can honestly say that I'm with Mr H on all of these points. So now we finally come to the concluding episode, and as with all end of series books the big question is will all loose ends by tied and more importantly how will it end for Arthur and his friends? There is often a lot of pressure on authors who have built up a huge fanbase with a series - should they write the story they originally planned or should they go out the way to please the fans? The internet has enabled these fans to broadcast their hopes and fears for all the world to see and there has been some debate in the past as to whether authors have an obligation to provide their fans with what they want. This is even more of an issue with books for young adults and children, as those in at the start have now aged by five or six years, and in that time tastes and ideals change and mature. 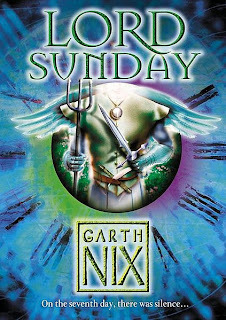 On the evidence offered by Lord Sunday, I would suggest that Garth Nix has provided a conclusion that is in keeping with the rest of the books in the series. As a result of this, some fans may be disappointed with the ending, some will be overjoyed, and many may be a little surprised. I am most definitely very satisfied with the ending, but more than that I will not say as I would hate to create any spoilers. Hmmm..... whilst on the topic of spoilers, I have always found it difficult to write reviews of final books in a series, for fear of giving too much away to readers who have not yet discovered the earlier books. So, choosing my words very carefully: the action continues at full speed from where it left off, at that agonising cliffhanger at the end of Superior Saturday; Arthur is becoming increasingly more Denizen, and therefore it is harder to like him and relate to his character; parts of the story are as dark as the darkest moments in earlier books and the tension levels are often at critical level; and as in previous books Mr Nix keeps the story from going stale with more clever twists. You will have to forgive me for not saying any more - long-time fans should understand my reticence here, and if you haven't yet delved into The Keys of the Kingdom series then you will forgive me once you have taken the plunge. 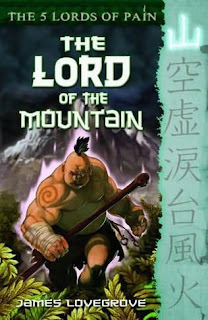 Garth Nix has an incredible and unique imagination - now that the series is finished I wish I in the position of someone newly discovering these books so I could read the whole series for the first time, from beginning to end in one sitting. Lord Sunday is published by HarperCollins, who very kindly sent me a copy of this book, and is due to be in stores on 4th March. Keep it clean, fellas. Fair fight. Okay. Do it. Don't go down. If you go down, get up. The bell, the fists, the fight. It begins, and the first round is death. The second round is the coffin. The third is the funeral. The Wolfe brothers know how to fight - they've been fighting all their lives. Now there's more at stake than just winning. Markus Zusak burst onto the international scene a couple of years ago with the amazing debut adult novel, The Book Thief. 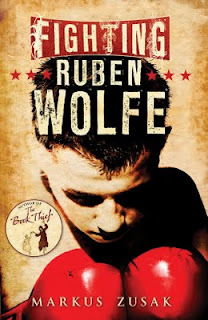 However, Mr Zusak has been writing for some time and this book for the younger market, Fighting Ruben Wolfe, was first published in Australia back in 2000. Thanks to Definitions this book is now being reissued with a stylish new cover, and please believe me when I say it is desperately in need of your attention. If ever there was a book written for disaffected boys who claim that they don't like reading then this is it. The story focuses on the lives of Ruben and Cameron Wolfe, brothers in a family that is going through difficult times. Their father is struggling to find work after a period of recuperation following an accident at work which led to him losing all of his plumbing jobs, their mother cleans the houses of other people. 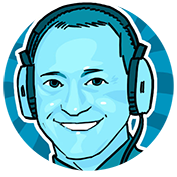 There is also brother Steve who, in the words of Cameron as he narrates the story, is "working and waiting and dying to leave home"; and finally there is their sister Sarah, who is turning to alcohol to ease her own frustrations and is starting to get a reputation at school for being a bit of a slapper. The boys have to put up with a barrage of wisecracks about their out-of-work father, but when one unfortunate boy suggests "if your family needs the money so bad, your sister should take up whoring. She gets around a bit anyway, I hear..." Ruben finally loses his cool and "smashes the guy, with bloody fists and trampling eyes". Word travels fast in this small community, and it isn't long before Perry Cole, the organiser of an underground boxing racket, is waiting for the boys outside their house with an offer - he wants the boys to box for him at fifty dollars a fight (plus tips). Of course, it doesn't take the boys long to decide that money like this could help solve some of the family's financial problems, although deep down they know they aren't really doing it for the money - they are doing it "...for some other reason. Some other reason that wants inside us." For me, the stand-out aspect of this book is Cameron's narration of the story. His voice is so typical of a disillusioned teenager: frustrated, anxious about the present and the future, rebellious and laced with boyish humour. His sensitivity also shines through, with his descriptions of his family and their various faults, and the close bond he shares with Ruben that grows even tighter as they go from one fight to the next. It is this, as well as the fighting, that will make this book so appealing to boys - many will read this and instantly be able to identify with Cameron and his feelings. It is relevant, without being obviously moralistic or patronising. 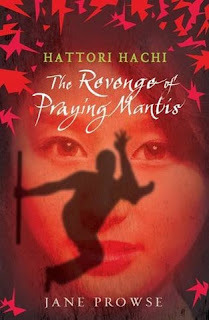 This book is about a bloody and savage sport, so obviously there is quite a high degree of violence exhibited at times. Sometimes this violence is pretty brutal, but the way Mr Zusak writes it, it becomes more poetic that gory. Boys with good imaginations will be able to picture the fights, blow by blow, but these violent moments are also tempered by Cameron's wonderful humour that runs throughout the whole story. There are many laugh-out-loud comments made by Cameron in his narration, a perfect example being his description of how he and Ruben walk their neighbour's unfortunately-named "fluff midget thing" dog Miffy - " .... and then there are these two juvenile idiots walking a ball of fluff down the road. It's out of hand. That's what it is. It's disgraceful". As you can probably tell, I really enjoyed Fighting Ruben Wolfe (ok... I'll admit I read it twice, I enjoyed it so much). It is only 179 pages long, so can be read quite quickly, although even some reluctant readers might decide to take their time over it to savour Mr Zusak's glorious prose. It is published by Definitions and is in stores now. My thanks go to the nice people at Random House for sending me a copy. Demons from the Dark Dimension pour through a portal in the wall of Pittingham Manor, ready to strike! Into this chaos stumble two twelve-year-old ghost-busters: psychic Alannah Malarra and burglar Wortley Flint. Up until now, they've only ever hunted tame, trasure-hoarding ghosts, but this is something else. The first thing you notice about Demon Strike is its fantastic cover featuring a particularly gruesome looking demon; it has a lenticular panel that enables the facial experssion of the demon to change as you move the book. I won't say any more, get this book and have a look for yourself. So is the inside as good as the outside? I will be honest and say it took me a few chapters to get into the book. In Chapter 2 we are introduced to A.N.G.E.L. Trooper Flhi Swift, soon to be promoted to Inspectre (yup... that's how it is spelt in the book), and I was initially worried that this character sounded very similar to Holly Short, the LEPrecon heroine of Eoin Colfer's Artemis Fowl books. And yes, there are similarities, but only because both books have gutsy non-human heroines who like to take risks and who don't always play by the rule-book (in Flhi Swift's case - it is more a case of "what rulebook?" as she seems to have broken every A.N.G.E.L. rule by the end of the story). However, Flhi Swift is not the story's sole main character - she has to share this honour with ghost-hunting psychic Alannah Malarra. Alannah is the daughter of famed (and currently missing in action) psychics Ben and Sadie Malarra. However, where her parents hunted ghosts for altruistic reasons, Alannah's motives initially seem far more mercenary - she knows that ghosts only remain on earth if they have something precious worth staying for; thus where there is a ghost, there must also be treasure. With this in mind she has begin to amass a small fortune, although we soon discover that she intends to use this treasure to fund the search for her missing parents. Alannah is a strong character who misses her parents deeply. She is discovering psychic powers that she does not understand fully, and this is a constant reminder of her parents, who had started to train her before they disappeared. She would be a very lonely girl were it not for her closest friend, the fantastically named Wortley Flint, Alannah's partner in crime, a twelve-year-old boy with a talent for breaking into houses. Wortley is the perfect sidekick, and provides many of the laughs in the story as he hates the whole ghosthunting aspect of their work and would much rather be sat in the safety of his own home. In fact, I was chuckling to myself before I had even reached the end of the third page as a result of Wortley's unfortunate run-in with a pair of hyenas. The banter between these two is another fine aspect of this book; they are constantly bickering but there is always an underlying note of affection in this, as they genuinely care for each other. This becomes even more apparent as they take it in turns to face mortal danger, with the other coming to the rescue in some way or other. This book is laugh-out-loud funny in places, but it also has many moments of extreme tension and fast-paced action. I said it took me a few chapters to get into it, but once I had it became another book that I wanted to complete in one sitting. The quieter, poignant moments where Alannah is missing her parents, or is fearing over the safety of her friend, are also an important element to the story as they help the reader relate to her character more. Thus, when she is in peril, we become even more fearful for her safety. Despite only mentioning three characters in this review so far, the story hosts a wealth of colourful secondary characters, both good and evil (and some a little in-between). Each one adds to the story in their own little (or big) way, and the dialogue is always well written and believable. I believe this book is intended to be the first in a new series of A.N.G.E.L. Patrol books and I hope we will see many of these characters again in future books. Whenever this may be, I will be at the front of the queue to get my hands on a sequel. 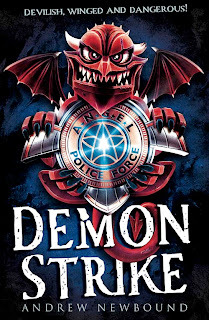 Demon Strike is due to be published by Chicken House on 1st March, but Amazon already have copies so you may spot one on the shelves in stores a little early too. I would suggest it is best suited to the 9-12 age group, although older readres may also find it an enjoyable read. You can also find out a little more about Andrew Newbound and Alannah, as well as read the opening chapter, at the Go Away Ghosts website. 4. Lovely Treez (unsigned copy of the book). I will now endeavour to contact the winners through email and/or Twitter. Please reply with details of postal address within 48 hours or I will draw another name out of the hat. Many thanks to the kind people at Puffin Books for providing the prizes. I am finding this a very difficult book to review for this blog. Why? Well I really enjoyed reading it but I don't know how many boys would get on with it. Boys are very picky when it comes to choosing their stories, and a female main character is quite often an aspect that will discourage them. Unless it is Lara Croft, of course. The book is also narrated in the first person.... OK for boys when this is another boy, but when it is a girl narrating then 9 times out of 10 they won't be interested. Add to this melting pot the fact that Lucy, the main character in this book, mentions Ugg boots within the very first sentence and you will have many a boy reaching for his games console of choice and leaving this book to gather dust. I do not pretend to understand why this is the case as there are many great boy-friendly books out there with female main characters. However, if you can get past the occasional mention of Uggs and kissing then you will be rewarded with a highly original, very funny and occasionally poignant modern take on the traditional ghost story that will certainly make you laugh out loud, and may even make you cry (yes boys.... it is ok to cry when reading a book). The book only has 184 pages, and believe me, they will race by once you get stuck into the story as the plot races along at a furious pace. This book has everything a great stroy needs - it is well written, it has realistic and memorable characters, sparkling dialogue, incredible humour and moments of nail-biting tension. Boys..... if you're still unsure then show your sister this review (or even better go and buy the book for her), then when she isn't looking sneak a read of her copy as it really is worth your time! I will be perfectly honest and say I was a little unsure when Tamsyn Murray contacted me on Twitter asking if I would like to review this book for my blog as I didn't know whether it would be to my taste. However, it is good once in a while to try something a little different and I am really glad I did, so thanks to Tamsyn and her publishers for sending me a copy. My So-Called Afterlife is published by Piccadilly and is available in stores now. In a town in which the inhabitants are plagued by dreams, Jamie Wave sleeps on undisturbed. Is he the only person in Cawstock not suffering from nightmares? At school, they make masks in the Art lesson. Jamie and his friend Jinny make a tiger mask. Jamie has gone to a lot of trouble to get it just right: with wire for whiskers, fake fur and realistic markings it looks really good. But when he puts it on something very strange happens. Jamie -- for a few seconds -- becomes a tiger! Has he been touched by magic, or is the magic already inside him. First of all..... what a stunning cover! It first caught my eye when someone posted an image of it on Twitter, I then read the synopsis, thought it sounded great so I managed to persuade the nice people at Scholastic to send me a copy. 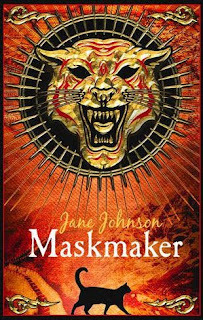 I have since discovered that Jane Johnson has written several other books for children - The Eidolon Chronicles - although Maskmaker is not part of this series. I really enjoyed reading Maskmaker, although it is quite difficult to categorise it. It has elements of fantasy, horror and adventure in equal measures, as well having a healthy dose of humour laced throughout. These elements combine perfectly to make an entertaining and thrilling story - yet another book I had to force myself to put down in order to get some much needed sleep this past week. When I was a child, my favourite TV show was Mr Benn - I loved the concept of trying on a costume, walking through a magic door and finding myself in an adventure appropriate to that costume. The premise of Maskmaker is very similar - Jamie finds himself drawn to the mysterious Maskmaker's shop in a run-down part of town, and through actions beyond his control he finds himself walking through a portal in space and time wearing the mask of a Tuareg warrior, and ends up in the Sahara Desert in 1663. Throughout the rest of the book this happens to him again on several occasions, each time a different mask taking him to another far-off location on a reluctant mission for the increasingly sinister Maskmaker. Jamie's character is well developed throughout the story. He is one of life's victims, bullied at school with only his ability to make said bullies laugh with his vast repertoire of jokes to save him from a major beating. As the story progresses he uses this ability to great effect in the various exotic locations he finds himself in, but in these places it is no longer his lunch money he wants to keep hold of.... now it is his life at stake! However, despite us seeing Jamie become a far stronger character through these tests, it does become a little repetitive after a while and so I would suggest, as the publishers do, that this book is suitable for the 9+ age group as older readers may find the repetition a little annoying. For those younger readers however, this remains an exciting and thoroughly enjoyable adventure story. The horror elements in the story will not give children nightmares, but are enough to have them jumping nervously at the nighttime sound of a hooting owl or barking dog, for in Maskmaker these animals are the servants of the evil King of Shadows. The author uses Jasper the talking cat, and the banter that develops between him and Jamie, to help lighten many of these more menacing scenes. Maskmaker is published by Scholastic as a paperback edition and is due to be in stores on 1st March 2010. The sister is a knife-thrower in a magician’s stage act, the brother an undertaker’s assistant. Neither orphan knows of the other’s existence. Until, that is, three terrible Aunts descend on the girl’s house and imprison her guardian, the Great Cardamom. His dying act is to pass the girl a note with clues to the secret he carries to his grave. Cardamom was one of three explorers on an expedition to locate the legendary Amarant, a plant with power over life and death. Now, pursued by flesh-eating crow-like ghuls, brother and sister must decode the message and save themselves from its sinister legacy. I first heard about Mortlock towards the end of last year. The synopsis sounded like just the sort of story that I love and so I was very excited when it arrived in the post from the nice people at Bloomsbury. No standard white or brown padded mailer for this book either - it landed on my doormat in a black jiffy bag, with a green raven logo on the address label. Bloomsbury are putting a lot of effort into promoting Mortlock, and having just finished reading it I can totally understand why. This book is a dark and twisted horror story in a glorious Victorian setting; it is so good that I am still struggling to believe that this is Jon Mayhew's debut novel. This is a stunning story and, cliched thought this may sound, you really will not want to put it down. Read it on the train and you will probably miss your station; read it at night and before you know it will be the early hours of the morning (and then you won't dare turn off the lights for fear that those noises outside or in the attic may be the scratching beaks or talons of the abominable Ghuls). The pacing of the story drew me in right from the very start, and with all the requisite peaks and troughs to keep the tension mounting throughout the book I found myself on one hell of an escapist ride. Mr Mayhew obviously put a great deal of time and effort into researching this story. His atmospheric descriptions of the Victorian locations and characters reminded me very much of the work of a couple of my all-time favourite writers, Sir Arthur Conan Doyle and Edgar Allen Poe. The villains created by the author would also sit very well in a Poe horror story - the three Aunts that turn into the flesh-eating raven-like monsters are evil personified, and once they morph into these awful creatures and attack their victims the author is not afraid to continue with the detailed descriptive writing. There is certainly no attempt to patronise his audience by sanitising these scenes; they are gory and will keep the hearts of horror fans beating rapidly. Whatsmore, unlike some horror authors, Mr Mayhew doesn't go over the top by including too many of these gory moments - just enough to keep the tension at explosive levels whenever the Ghuls appear. Unfortunately for the story's main characters the Ghuls are not the author's only despicable and terrifying creation - just wait until they stumble across Lorenzo's Incredible Circus!!! On the subject of characters, Mr Mayhew has also excelled in this area too. Josie and Alfie are entirely believable; in fact, Mr Mayhew seems to go to great lengths to make them appear to be as ordinary as possible. Josie is described as being plain, with "dull brown" eyes and her brother "small and pinched-looking". As in the majority of these types of stories there is also a host of colourful secondary characters who come and go throughout the book; every one of these is believable, and they all help the story progress in their own little way. I believe Mr Mayhew plans to write two more books set in this era - if they are even half as good as Mortlock then he will surely earn a thoroughly deserved place in the pantheon of childrens' horror fiction. Bloomsbury have very kindly provided me with the opening chapters to Mortlock, which you can download here. 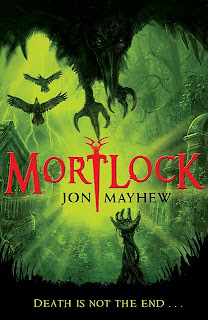 I am also going to be running a contest in the near future in which you could win your very own copy of Mortlock so please watch this space. Mortlock is due to be published on 5th April in a hardcover edition. But Lex’s luck is about to run out, because the Goddess of Fortune has selected him to be her player in the highly dangerous Games. Losing is not an option for Lex (particularly as it so often involves dying) but can he really win each of the perilous rounds? Given that the reward for doing so is money, fame and glory – all things that Lex is quite keen on – he’s going to do whatever it takes to make sure he will… and he’s certainly got good experience of cheating. I am not a huge fan of fantasy, but I really cannot work out why. I love The Lord of the Rings - it is one of my all time favourite books, but other supposedly excellent fantasy works just don't interest me. Even Terry Pratchett! There... I've said it, and I know that will upset a lot of people. Don't get me wrong - I have read some of his books, and enjoyed reading them, but I don't sit there waiting for the next book to be published, and I can probably count on one hand the number of Pratchett books I have read. So, having been sent a copy by the nice people at Headline, it was with no small degree of trepidation that I opened this supposedly brilliant YA fantasy book that one reviewer had already likened to this aforementioned comedy/fantasy author. Would this be the first scathing review on this blog? And the answer is..... no! In fact, far from it. I loved this book, despite it being a fantasy story, and the main reason is the fantastic titular character that Alex Bell has created. Lex Trent is the ultimate anti-hero - I went from cheering him on to despising the depths to which he would stoop to fulfil his own selfish and dishonest desires. Of course, because of Lex being such a scoundrel, boys will love this book; they will want to be like Lex, so should we be worried that we might have an increase in mischievous behaviour in schools should this book gain the popularity is deserves? As well as the brilliant development of Lex's character (and that of the other principle characters in the story), this book really stands out because of the author's fantastic imagination - she has created a fantasy world where the Gods have their own churches, take human form to interact with their mortal subjects and where these very same Gods delight in The Games, where they play with humans as if they were pieces on a chess board. In fact, refuse to take part in The Games and this is exactly how you may find yourself for the rest of eternity. In this fantasy world we also find many mythical creatures, ships that fly above the waves rather than through them, and incredibly, a world split in two, with the two halves joined by ladders of all things! Some boys may need a little patience as they start this book as it takes a while to get going. The opening chapters are used to set the scene and introduce us to Lex, but once the action kicks in they will certainly feel rewarded for their perseverance as from this moment the pace becomes breathless, with Lex going from one nail-biting escapade or swindle to the next with barely a pause. 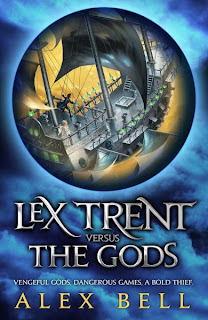 Lex Trent versus The Gods is published by Headline and is in stores now. Thanks to the very generous people at Puffin Books I have THREE SIGNED COPIES of TimeRiders by Alex Scarrow and a TimeRiders T-shirt to give away. 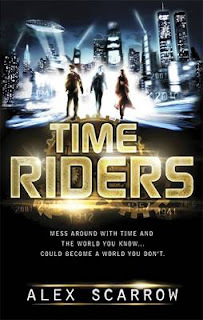 I posted a review of TimeRiders yesterday - it is a brilliant time travel adventure full of action and memorable characters. In order to win a copy of this book all you have to do is tell me in the comments box which period in time you would like to travel to and why? That's it - all very simple isn't it?! If you also publicly follow my blog then that will give you an extra entry into the competition. Sorry to any international readers but this contest is for UK entrants only. The first name drawn at random after the closing date will win a signed copy of the book and a t-shirt, the next two names will each get a copy of the book. Deadline for your comments is 8pm Tuesday 16th February. Please leave a coded email address with your comment (or email me directly at bookzone4boys(at)gmail(dot)com) so I know how to contact you should you be one of the lucky winners. All entrants must leave an email address with their entry, or email it to me. It is only 8th February and already I know that come the end of the year choosing a favourite book of 2010 is going to be an impossible task. One month into the year and I have already read so many outstanding new books, and TimeRiders is no exception. The 'About the author' blurb on Amazon says the following about Alex Scarrow: '....has written a number of successful thrillers and several screenplays, but it's YA fiction that has allowed him to really have fun with the ideas and concepts he was playing around with when designing games.' and the fun he had writing the book is definitely reflected in the story. As a teacher I know when a student really enjoys my subject as it is reflected in the quality of their work, and on the evidence of TimeRiders I would suggest that Alex Scarrow most definitely enjoys writing for young people. This is a superb action/adventure story, with great characters, a fast-moving and tense plot, snappy dialogue and plenty of humour. I think I may have mentioned in a previous post that I hated History at school as a result of a poor teacher, but these days I love it. In my book collection I have several of the 'What If...' books, where historians write short speculative articles about what would have happened if certain events in history had not happened, or had happened differently (e.g. What if... the Spanish Armada had been victorious? ), and this is exactly what Alex Scarrow does with TimeRiders - in this case focusing on how different our world might be if Hitler had not tried to invade Russia, and had instead focused his forces on the invasion of the Western Front, leading ultimately to victory in Europe and eventually the United States. This makes for a fascinating storyline, as members of the team who remain in 2001 are placed in an incredibly dangerous situation due to a timeline that changes as a result of the intervention of the team members who initially go back to 1956. Confused? Believe me, you won't be.... Alex Scarrow handles it far better than I am in this review. Time travel has obviously been seen many times in books, TV and movies, but the concept of 'rescuing' young people who are about to die in their own time, and then teaming them up to deal with others who would change time for their own nefarious reasons, is a new one to me. This premise relies on the notion that significant changes made in the past create potentially unstoppable, world-destroying tidal waves that race into the future causing massive changes and devastation. The fact that these young people were about to die anyway causes a tiny ripple, with little effect at all, making their recruitment have little impact on the future timeline. The other element of this story's take on time travel that I found refreshingly original was the splitting of the team so that some are fighting battles in the past, whilst the others battle away in their present, so we have action going on in two different periods of time. The three heroes in question are recruited at the very beginnning of the books. Liam is an Irish steward on the 'mighty' Titanic, Maddy a computer geek travelling on a plane in 2010 that is about to be blown up by a bomb, and Sal a 13 year old from an unrecognisable Mumbai of 2026. They have been selected due to their various individual talents; they are not super-heroes, they do not have any form of martial arts training, they are just normal teenagers. Their rescuer/recruiter, himself a TimeRider of many years, teams them up with a genetically engineered super-human called Bob, who is very reminiscent of Arnold Schwarzenegger's Terminator (in fact, he is almost christened Arnie by the team). This, book, the first in a series, very much focuses on Liam and Bob as they travel back to 1956 USA, and as such Liam's character is developed more fully than those of the others. Sal, in particular, is a character we really do not get to 'know' fully but hopefully this will come in later books. At times this book is also quite thought-provoking. The villains of this story travel back in time to change it as they feel their 2066 world has become ruined by over-population, pollution and religious conflict; they go back to 1941 not for material gain but in the hope that they can make changes to improve the world of the future. However, no plan is ever perfect and power can corrupt, and the desired effect is far from preferable. As a reader is got me thinking if I had the power to go back through time, where would I go and would I want to make any changes? For example, would preventing the events of 9/11 lead to a better world or a far worse world than the one we live in today? Is it a chance worth taking? These, and many other similar questions will run through your mind as you read this book. As I have already said, this is the first in a new series from Alex Scarrow, with the second promised for August 2010, and we are teasingly informed that 'Next Stop.... Dinosaurs!'. Roll on August - I can't wait to see where the author will take these characters next. Until then, TimeRiders is published by Puffin and is in stores already. Exciting news: watch this space for a great TimeRiders competition coming tomorrow, where you could win a signed copy of the book. IF YOU LIKE HORROR THEN GO OUT AND BUY THIS BOOK NOW! Forget about reading the rest of this review - you are only wasting time that should be spent shooting out to your local bookshop to buy this book! Still here? Why? Let me phrase it another way then - if you don't go out and buy this book then I will make sure Mr Mumbles finds out and he just might want to pay you a visit, and that is something you really, really do not want to happen. Mr Mumbles is the ultimate horror villain - if you're old enough, think Freddy Krueger, Jason Vorhees and Michael Myers all rolled into one. If you are not old enough to know what I am talking about then ask your parents. He lurks in the deepest depths of your childhood memories, just waiting for you to remember him. Just waiting for you to open that doorway to let him back into your life..... with a vengeance! And when he does come back, whatever you throw at him, however much you might try to hurt him, he will shrug it all off in a seemingly indestructible manner and he will chase you to the ends of the earth... or even worse - to Hell and back! ‘And his lips... Oh, God, the lips! Mr Mumbles had always had problems with talking but it had been a speech impediment, that was all. Now his whole mouth was disfigured. The kids/YA horror genre seems to be having a bit of a renaissance this year. I have already reviewed several outstanding books in this genre that are due to be released in 2010 (Witchfinder and Crawlers) and Mr Mumbles is yet another outstanding addition to this list. Some horror stories go out of their way to appear bloody and gory - literature's version of a slasher movie - but Mr Mumbles, like Crawlers, hits you on a psychological level. There is very little blood in the story - the horror comes from the relentlessness of Mr Mumbles' attacks, and the fact that his creation began many years ago in Kyle's past, when he started off as a harmless imaginary friend. Many children had some form of imaginary friend when they when younger, but did you ever wonder what happened to them once that child grew up and forgot about them? This is the sort of thing that will scare kids who read it, and this is a good thing as kids love to be scared in this way. In this story Barry Hutchison also delivers some great characters. Aside from Kyle, there is also the fearless, and slightly mysterious, Ameena who appears on the scene to aid Kyle in his quest to escape/destroy Mr Mumbles. There is Kyle's mother - a seemingly normal, loving single-mum, who obviously has a few secrets she wants to remain hidden from Kyle such as who his dad is. And then there is Kyle's Nan - at times totally barking mad, but also showing occasional lucid moments that when coupled with her mad ramblings help to reveal hints about Kyle's childhood years. Mr Hutchison uses these hints sparingly - he wants to keep you guessing what is going to happen next, and he does this incredibly well. And just as you think you have it all worked out...BLAM! like Mr Mumbles he he hits you full in the face with a twist that you never saw coming at all. This book has everything: the aforementioned horror, great characters, nail-biting fight scenes, heaps of tension and just enough humour to make you smile (just a little) between the horror scenes. 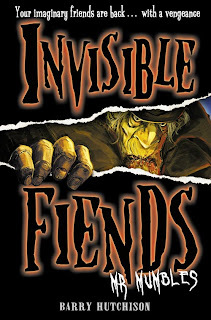 It is the first in a planned series of six Invisible Fiends books, with the second (called Raggy Maggie) due to be released in July 2010. There is a short excerpt from Raggy Maggie at the end of this first book, and it looks as if it might be even more terrifying than Mr Mumbles. The flash-forward prologue of Mr Mumbles also gives us a taste of what is to come - unlike many books where the story set-up in the prologue is usually concluded within the book, the author has used his prologue to set the scene for the whole series. The ending of Mr Mumbles is also a blinder, although its disturbing nature is likely to impact more on the psyche of adult readers. Mr Mumbles is published by HarperCollins and is in stores already. The Invisible Fiends is also well worth a visit and if you go to this Bebo page before the end of February you could win one of 50 copies of the book. Last month I wrote a glowing review of DropZone, the new book from ex-SAS member Andy McNab. DropZone is the first in a new series of books from Mr McNab, focusing on the adventures of Ethan Blake as he joins a team of young skydiving addicts who are also involved in covert military operations. Mr McNab was very kind to take time out from doing film work in the US to answer the questions I sent him. DropZone is very different from your previous Boy Soldier series. How did you get the idea for it? It was while I was freefalling in Switzerland two summers ago. There was a group of French teenagers who would stay at the DZ for a couple days jumping, then would disappear for a couple of days before reappearing for some more jumping. They were always driven about in an old minibus by an older guy who was in charge. It got me thinking, what a great cover story this group potentially had. They could be freefalling for a couple of days, then go off and save the world before returning to do a bit more freefall, just as if nothing had happened. And I thought maybe that would make a good story? DropZone is the first book in your new series. Do you know how many books you hope to have in the series and have you plotted out the storylines for any of these already? DZ 2 is nearly complete but for now I haven’t thought of any further storylines. I’m hoping that readers enjoy the first two books so that I can write some more! What in your opinion are the main differences between writing for adults and writing for Young Adult market? Not much, that's probably because I'm not that clever. Of course, I have to be more guarded about things such as violence and swearing but I think there is already far too much out there for teenagers that is patronising. They are more switched on than they generally get credit for. I just write the stories as they come into my head. It's really just a collection of pictures that I try to put down on paper so, to me, it doesn't matter if it's for a teenager or an adult reader. I think the main one is the hours of TV I watched when I was a kid. I don't think in chapters, but in scenes. To me, the end of a chapter is a commercial break. When I write I just try and get a group of scenes in line so they make sense! As for technique and trying to give the reader a sense of place, Joe Simpson's book, Touching The Void has had a big impact on me. The way he describes being wet and cold and at the same time what was going on in his head is excellent. I must have read the book at least 20 times. The skydiving you did with the Air Troop obviously helped you a lot with the research for DropZone. What other research did you have to carry out? I have 1832 freefall jumps and maybe 200-ish static line jumps. I didn't start jumping until I joined the Special Air Service where I learnt how to static jump out of C130 Hercules aircraft to earn my wings. Then I was sent to Air Troop where I learnt how to freefall. I just loved it and it became a passion that I carry on now as a sport. So I suppose that’s all the research I’ve done. DropZone has some really interesting characters. Are any of them based on people you know? Will we find out more about the mysterious Natalya in future books? Yes, on both counts. The only way that I can create characters is by basing them on people that I know. Those in this story are amalgamations of people who I knew whilst I was in the Army. It's just a quicker and easier way of creating characters. Why try to make one up when you already know a good one? Obviously, all of Ethan’s good points really belong to me! Do you have a favourite author? What really appeals to you about their work? I know it's a cliché but it’s Charles Dickens. His characters are totally believable and when they are sad, you are. But it's just not the characters, it's the stories and the way that he wraps human emotions around them. Great Expectations, I think, is his best. If you replaced the horses and carriages with cars, and the coal fires with central heating, you would think that it was written last year. Without a doubt, Joe Simpson’s Touching The Void and Dickens’ Great Expectations. It has to be the same books. Do you feel that it is important that young people should read for enjoyment? Did you read a lot when you were younger? Yes, very important. I never read when I was a kid, I just watched TV. That was the reason I had a reading age of an 11-year-old when I joined the Army. In fact, the first book I ever read was as an Army recruit and it was written for a primary school kid. But the feeling of joy and accomplishment I got after reading a whole book was indescribable. Can you give us any hints as to what we can expect from your next book in the series? Yep, more freefall - and cage fighting. What more do you need in life? Thank you for taking the time to answer my questions Andy and I hope this new series is a great success. DropZone is due to be released by Doubleday as a hardcover edition today, 4th February. Alien invaders have exploded a nearby star, turning it into a supernova, and only Johnny Mackintosh knows the Sun is next in line. Abandoning school and his football team, he and Clara travel to the galactic capital seeking help. Their mission stalls. After a decade missing, Johnny’s mysterious brother reappears, but what was he doing all those years away and whose side is he on? So begins an epic adventure full of devious aliens intent on ruling the galaxy and killing Johnny along the way. Can he survive to save his brother, and planet Earth, in time? Not too long ago a fellow Twitter user asked her followers if they could recommend any good YA Science Fiction books. I immediately hit reply and told her that Keith Mansfield's Johnny Mackintosh and the Spirit of London was a must-read in this genre. 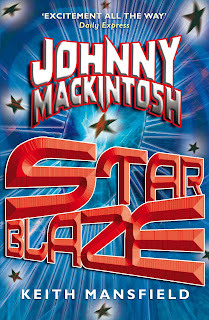 A couple of days later I was gob-smacked to receive an email from Mr Mansfield thanking me for the mention, and with the offer of a copy of his latest book, Johnny Mackintosh: Star Blaze. Science Fiction is a genre that does not appear in YA fiction anywhere near as often as it should. Joe Craig's Jimmy Coates series has a sci-fi element with its genetically engineered titular hero, and the recently released Monster Republic also has a strong sci-fi storyline. However, both of these are set with both feet firmly rooted on Planet Earth with zero chance of space travel, let alone battles across the galaxy. Now I'm no die-hard Science Fiction fan when it comes to books, and apart from the Stainless Steel Rat series by Harry Harrison, it is pretty rare for me to read an adult book in this genre, but I was intrigued by the synopsis and reviews I had read for Spirit of London and decided to give it a go, and I was certainly glad that I did - it is a superbly written action/adventure story made even more enjoyable by its highly original (in YA fiction at least) outer space setting. However, this review is not about Spirit of London. Ever since reading (and being disappointed by) Charlie and the Great Glass Elevator I have often felt a little pessimistic before reading sequels to books I had thoroughly enjoyed - will the author manage to recreate the magic with their second book? It happens with movies as well (Speed 2 anyone?) and how many musicians have struggled with that "difficult second album" (thanks must go to Mr Mansfield for that allegory). However, with Star Blaze my pessimism was totally unfounded - in the same way that The Empire Strikes Back improved on Star Wars: A New Hope, so too does Star Blaze improve on its predecessor, and that is praise indeed. And the parallels don't end there - like Empire, Star Blaze is also a much darker book in places than the first in the series. There are so many things I loved about this book that I don't really know how to start (and I also have to be very careful not to produce any spoilers for those of you who have not yet read Spirit of London). Firstly, the characters are very well developed.... all of them, not just Johnny (ok, nearly all of them - some element of mystery has to be maintained in order for there to be revelations in future books). The world building is also outstanding in my opinion, although as I have already said I am no expert on this genre. However, I personally found it both convincing and generous in its detail, without becoming unwieldy. On top of this, there is also enough action to rival the glut of boy secret agent books we have seen in recent years, and the plot twists and turns so it is difficult to second guess exactly what will happen next. Mr Mansfield gives the reader just enough information to keep them nervously attempting to guess where the often nail-biting story is going, and occasionally I guessed correctly; however, there were also many occasions where my guesses were way off course. I have a feeling that in this modern world where vampires seem to be ruling the roost in books, TV and other areas of modern culture these books could be easily overlooked. However, with a little perseverance to get fully into the story I doubt very much that many readers will put these books down half finished once the action kicks in. As a small addition to this review I thought I would just say a little more about Harry Harrison's Stainless Steel Rat series that I mentioned earlier. For Young Adults who like the Science Fiction genre, and who also like a little humour in their books, then this series is definitely worth trying. The series starts with The Stainless Steel Rat, although a number of prequel books covering the earlier life the of main character, "Slippery Jim" DiGriz, were later written. "Slipper Jim" is a con-man and thief who is caught and then drafted by the powers-that-be in order to aid them in their fight against more serious criminals - he really is the sort of hero that Young Adult readers will love. With just over one week to go until the winner is announced on Wednesday 10th February, I have only just discovered this nice little video from the people at Waterstones, with a verbal snapshot of each book. Personally, I'm a little torn between The Toymaker and Meteorite Strike as my personal favourites from the list. However, as I am a sucker for good, action serial books then if I was forced to choose under conditions of extreme torture then I would have to plump for Meteorite Strike by A.G. Taylor.